It had been a long evening. The patrons at the box office had been insufferably demanding and more than unusually fussy. Libby couldn’t wait to get off work and return to her apartment for some debrief time with a nice hot cup of tea. As she was about to leave the theater, she heard a voice behind her, calling her to wait. She turned to see Peter, her dear friend for so long, coming toward her. “Let me walk with you to your car?” he asked, pulling his coat on over his usher uniform. “Of course!” Libby replied, a warm smile setting in. Peter always knew how to help relieve the stress, in part due to his understanding of the demands of the theater-goers. “What a night, huh?” he asked as they walked down Broad Street. “You too?” Libby replied, raising her eyebrows in sympathy. 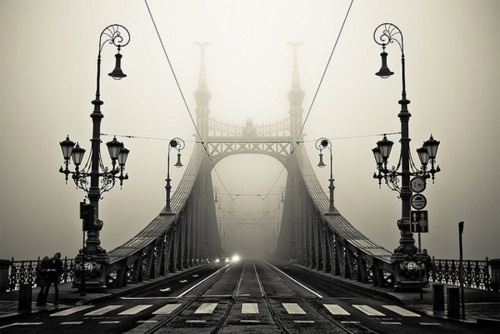 They had come upon West Moreland Bridge and had stopped at the middle, the decorative aged molding inviting them to stop a moment and look out at the swirling fog over the water below. Libby’s last words came out cracked as she dashed tears away that were now trickling down her cheeks while Peter silently looked down. Before she knew it, his hands were on her shoulders, turning her to him, then gliding down her arms to wrap her hands in his. “Libby. Look at me,” Peter said softly. Libby’s eyes shone even more brightly in the lamplight at the sound of his voice so gently speaking her name, but she slowly raised them to meet his. Never had she seen such tender, genuine honesty reflected in those blue eyes of his. It was captivating, steadying, and promising all at once. Even had she wanted to, Libby couldn’t have looked away. Libby couldn’t speak, she was so overwhelmed by this boy’s promise to her. She merely let the tears fall, burying her head in his shoulder, letting his arms wrap around her. Though she didn’t know much, she was certain of this one thing: life as she knew it was about to change. Next Post Is Your Friendship an Afterthought or a Main Feature?